In the spring of 2016 Gallery ROM was a partner in Artscape Norway, a project initiated and produced by Jaroslav Fragner Gallery in Prague. 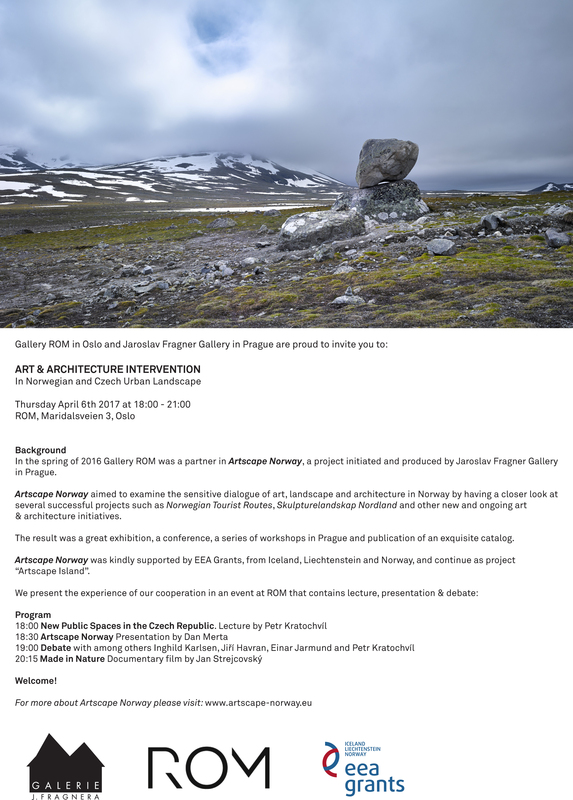 Artscape Norway aimed to examine the sensitive dialogue of art, landscape and architecture in Norway by having a closer look at several successful projects such as Norwegian Tourist Routes, Skulpturelandskap Nordland and other new and ongoing art & architecture initiatives. The result was a great exhibition, a conference, a series of workshops in Prague and publication of an exquisite catalog. Artscape Norway was kindly supported by EEA Grants, from Iceland, Liechtenstein and Norway, and continue as project “Artscape Island”.